Leading technical furniture manufacturer, IAC Industries, launched their new Web site Wednesday. 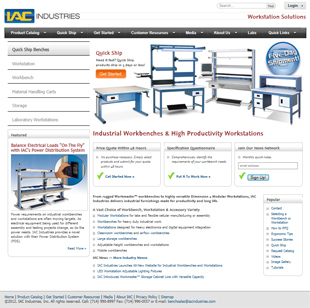 The site has been updated to make it easier for customers to discover IAC's precision industrial workstation products. The site's online catalog has been rewritten to provide more critical information and make it easier to select from IAC's choice of ergonomic workstations, industrial workbenches, cleanroom benches, storage cabinets, material handling stands and rolling carts, and related accessories. The online catalog is organized by categories to provide a clear path to what the customer is looking for. IAC, based in Brea, California, has also added new sections to their site such as "Getting Started," "Customer Resources," and "Rich Media," which further add to the ease of navigation and customer satisfaction. The Quick Ship section provides information about IAC's popular ready-to-ship product configurations. Q Source is an IAC distributor and you can also research products and place an order for IAC products at QSource.com. Check out our IAC Industries section or contact us by email or phone (800-966-6020). Our YouTube Channel features an excellent tutorial video about how to assemble an IAC Dimension 4 Workstation (also available in blog form at The Q Source Resource).